The case of Rocky Myers is a window into so much that’s wrong with the death penalty in this country. The 53-year-old, who has an intellectual disability, was saddled with an incompetent lawyer, convicted on the evidence from a key witness who has since recanted his testimony, and sentenced to death by a judge who imposed death sentence against the jury’s wishes. 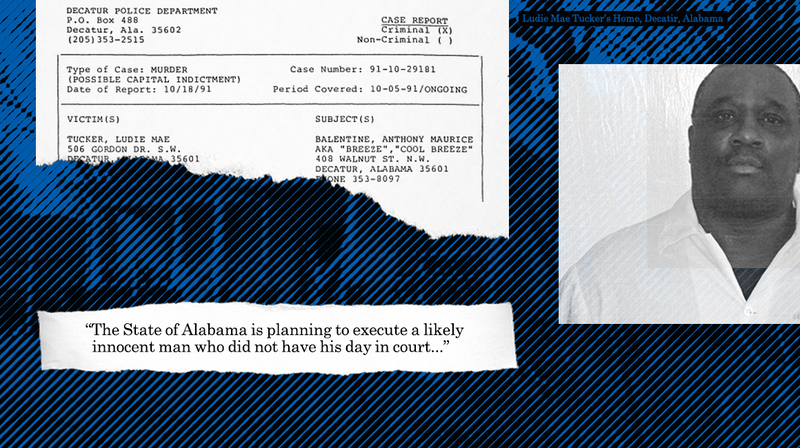 Now he’s one of 175 prisoners on death row in Alabama – despite all the faults in his case – and with absolutely no evidence tying him to the scene of the crime. The Supreme Court has ruled that defendants with intellectual disabilities like Rocky “face a special risk of wrongful execution.” We saw how that played out in Rocky’s trial and conviction, which were riddled with problems that should have never lead to a conviction, let alone a death sentence. In 1991, Rocky’s neighbor, an elderly white woman named Ludie Mae Tucker, was murdered in her home by a man who came to the door asking to use the phone. Testimonies from key witnesses implicated another local man, Anthony “Cool Breeze” Ballentine of the murder, but a friend of that man’s family, after learning about a reward offered in the case, offered detectives an affidavit implicating someone else – a short, stocky Black man. Rocky Myers, who lived across the street from Ludie Mae and fit the physical description, was an easy target. Despite having no history of violence, and not a shred of forensic evidence tying him to the scene of Ludie Mae’s murder, an overwhelmingly white jury (including one juror who used a racial epithet to describe him) convicted Rocky of capital murder. The jury went on to recommend a life sentence, but the judge overruled them and instead sentenced Rocky to death. It was an exercise in the use of “judicial override,” a practice that has since been outlawed. After the conviction, a lawyer took up his case but then quit in the middle of his state post-conviction appeal, without even informing Rocky. Rocky paid the price for the lawyer’s unconscionable abandonment. The filing deadline for his federal appeal passed, and by the time Rocky found out he’d been dropped as a client, it was too late. It seemed there was no way out of his wrongful death sentence – but there is. Alabama Governor Kay Ivey has the power to grant Rocky clemency. We must speak up now, because Rocky is dangerously close to receiving an execution date. Sign the petition demanding that Governor Ivey do the right thing and grant Rocky clemency. Your state could execute Rocky Myers – yet he could be innocent. Grant Rocky clemency and save him from wrongful execution.